After morning pickup at your Perth CBD hotel or a central meeting point, travel to the delightful Caversham Wildlife Park, where you can wander among the open-air exhibits and see with Australia’s amazing wildlife, including a koala, kangaroos, and a wombat. Continue on to the coastal town of Cervantes, where you’ll get a behind-the-scenes look at the local lobster fishing industry. During an audio-guided tour of a lobster processing plant, stand on a catwalk above an impressive 20 tons of live rock lobster. Afterwards, enjoy a fish and chips lunch with an optional lobster upgrade at the Lobster Shack. 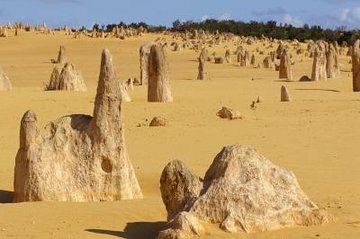 Experience one of Australia’s most mystical landscapes with a guided tour of Pinnacles Desert, located inside Nambung National Park. Walk among the iconic and mysterious formations that are believed to be remnants of prehistoric sea shells, and browse exhibits at the visitor center to learn more about the area’s fascinating geologic history. Next, get your adrenaline pumping with a 4WD adventure across Lancelin’s massive sand dunes, some stretching 1.2 miles (2 kilometers) wide. You can also careen down the dunes on a sandboard for a unique and thrilling desert experience. Rest easy on the return drive to Perth, where your tour concludes with hotel drop-off at approximately 7:30pm. Tour may operate with morning in coach and afternoon in 4WD, or depending on passenger numbers, in the 4WD all day. Sometimes due to soft sand dunes delays may occur.